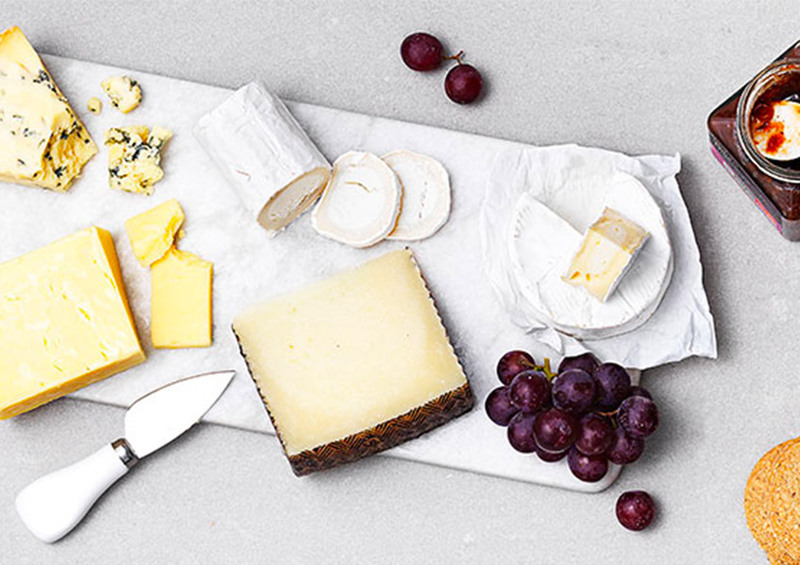 This platter includes Spanish manchego; Barber’s farmhouse Cheddar; French Brie; French goat’s cheese and blue Stilton®, with caramelised onion chutney and oatcakes. French Goats’ Cheese (Goats’ Milk). Blue Stilton® Cheese (Cows’ Milk). Mature Cheddar Cheese (Cows’ Milk). Manchego Cheese (Sheeps’ Milk), Preservative: Lysozyme (Egg). Rind Only: Preservative: Natamyon. Oatcakes: Oatmeal (86%) (Oat Gluten), Vegetable Oil, Skimmed Milk Powder (Cows' Milk), Sea Salt, Raising Agent (Sodium Bicarbonate). Red Onions (Red Onion, Sugar, Balsamic Vinegar (White Wine Vinegar, Grape Must), Cornflour, Salt, Water, White Wine Vinegar, Molasses, Garlic Purée, Ginger Purée, Black Pepper). Made with pasteurised milk. Expectant mothers and those susceptible to infection should avoid eating the Stilton®, Brie and goat’s cheese. Due to manufacturing methods this product may also contain wheat gluten and nuts. Cheese: Keep refrigerated. Re-wrap your cheese in the original packaging. Once opened use within 3 days and do not exceed the use by date. Oatcakes: Store in a cool, dry place. Chutney: Store in a cool, dry place. Once opened, keep refrigerated and use within 4 weeks. This product is not suitable for home freezing.